A NSW Parliamentary Inquiry into Port of Newcastle lease arrangements will lift years of secrecy. The NSW government made a secret deal with NSW Ports on 30 May 2013, covered under lease arrangements for Port Botany and Port Kembla. They agreed on a formula for charging the developer of a container terminal at the Port of Newcastle for container shipments. The purpose of their agreement is to limit or prevent the development of a container terminal at the Port of Newcastle. Until November 2013, the NSW government required Newcastle Stevedores Consortium to pay the Newcastle container fee as a condition of negotiating leasing the Port of Newcastle’s container terminal site from the government. On 5 November 2013, the NSW government decided to lease the Port of Newcastle. A lease condition is that the lessee is required to pay the government’s fee in respect of developing a container terminal. On 30 October 2018, the ACCC disclosed that an investigation is being conducted into whether the NSW government may have breached the “Commonwealth Competition and Consumer Act 2010” (Competition Act) in respect of the development of a container terminal at the Port of Newcastle. Since 7 June 2013, the ACCC has claimed that the NSW government stopped carrying on a business for the purposes of the Competition Act in respect of a container terminal development at the Port of Newcastle, because the government announced a policy decision on July 27 2012 that the state’s next container terminal will be developed at Port Kembla. The actual decision the NSW government took, but concealed, was to require the developer of a container terminal at the Port of Newcastle to pay the government a fee for container shipments, and to give this fee to a future lessee of Port Botany and Port Kembla. It is impossible for the NSW government to have a policy not to develop a container terminal at the Port of Newcastle when it is government policy to contractually require the developer of a container terminal at the Port of Newcastle to pay the government’s fee. The NSW government opposes a container terminal at the Port of Newcastle because it enables trucks to be replaced by trains for container transportation in NSW. A container terminal at Newcastle would justify building a rail freight bypass of Sydney, from Newcastle to Badgery’s Creek and Port Kembla. This bypass would be paid for with private funds by replacing Port Botany trucks with Newcastle trains. Additionally, it would enable trains to replace trucks for transporting the bulk of Sydney’s regional and interstate freight. More than one million container trucks travel through Port Botany each year. By 2040, there will be five million container truck movements. A rail freight bypass of Sydney will justify building the Maldon-Dombarton rail freight line to enable a container terminal at Port Kembla to operate interchangeably with Newcastle. The South Coast of NSW will benefit from direct access to a container port. By immediately building the section of the bypass line between Glenfield and Eastern Creek, containers can be railed between Port Botany and a new intermodal terminal in outer western Sydney, using the existing rail network. There would be no need for the intermodal terminal at Moorebank. The remainder of the line – from Badgery’s Creek to Newcastle – will take about 10 years to build. This allows ample time for an orderly transfer of operations from Port Botany to Newcastle and Port Kembla. Upon line completion, containers would be railed between Newcastle and intermodal terminals in outer western Sydney, where they would be de-consolidated at the intermodal terminals and the goods transported to their end destinations in Sydney. Export goods manufactured in Sydney would be consolidated into containers at the intermodal terminals and the containers then railed to Newcastle for export. Empty containers would be railed from Sydney to all regional areas of NSW to be filled with export goods and the containers then railed to Newcastle for export. All container trucks would be removed from Sydney’s roads. Freight currently entering Greater Sydney by road can be railed. There would be no need to build stages 2 and 3 of the $5 billion Northern Sydney Freight Corridor, to provide the equivalent of a dedicated rail freight line between Newcastle and Strathfield. There would be no need to build the $1 billion Western Sydney Freight Line, between Chullora and Eastern Creek. There would be no need to spend $400 million on upgrading the Port Botany rail freight line. There would be no need to connect Port Botany to WestConnex for the purpose of trucking containers. Freight would be removed from the Wollongong-Sydney rail line. All of Sydney’s current rail freight capacity would be used for passenger services to provide a higher economic return than freight. All of the current rail capacity between Newcastle and Sydney would be used for passengers. A second rail bridge would be built over the Hawkesbury River as part of the rail freight bypass. The short parallel runway at Sydney airport could even be extended from 2600 metres to 4000 metres after terminating container operations at Port Botany. Direct rail access to a container terminal is a pre-condition for regional economic development because more than 90 per cent of world trade in goods is conducted using containers. 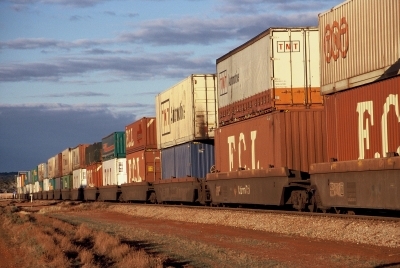 A rail freight bypass would enable Sydney firms to relocate to regional areas. The Committee will report on February 28 2019. Inquiry into the impact of Port of Newcastle sale arrangements on public works expenditure in New South Wales. the Port Botany Rail Line duplication. intermodal terminals and rail road connections in southwest and western Sydney. other additional public road infrastructure requirements due to the additional road freight movements in Sydney under the existing port strategy. The nature and status of the port commitment deeds, the extent to which they contain limitations on container port movements, and the terms and binding nature of any such commitments. The extent to which container port limitations contribute to additional costs for NSW industries who are importing or exporting from New South Wales, especially in the Port of Newcastle catchment. That the committee report by 28 February 2019. * Mr Justin Field MLC is substituting for Ms Cate Faehrmann MLC for the duration of the inquiry.